Coltrin branded Braeburn Pharmaceuticals CEO Behshad Sheldon as a leader in medical innovation and a key voice on social justice issues relating to the stigma of opioid addiction and its treatment. 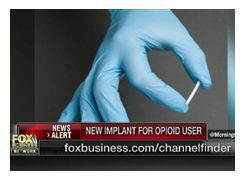 Coltrin also publicized Probuphine, the first-ever 6-month implant for opioid addiction, in top-tier print, broadcast, in digital markets in both national and local publications. Business, Inc. Magazine, The New York Times, USA Today, WebMD, Marketwatch, Institutional Investor Magazine, etc.